You can choose between two different types of calendar views, Single Unit View and Multi-Unit View. Find out which function each of the calendar versions has and how to interpret what you see. The Single Unit Calendar View will show you one property/room type at a time with a time span of roughly one month. At the top left of the calendar you can choose the month and year you want to see. Or you can simply scroll up and down to see other months. 💡 Note: You can see a max. of two years of past bookings. At the top right of the calendar, you can choose the property or room type you want to see. All booked bookings from Lodgify and the ones imported via the Channel Manager appear in red. Tentative bookings appear in orange. Closed periods created in Lodgify appear in black. Bookings/occupancies imported via iCal appear in grey. Dates that lie in the past are grey, dates in the future are white. To edit a booking you can simply click on it and a slide-in window will appear to the right. 💡 Note: Bookings imported via iCal cannot be edited. 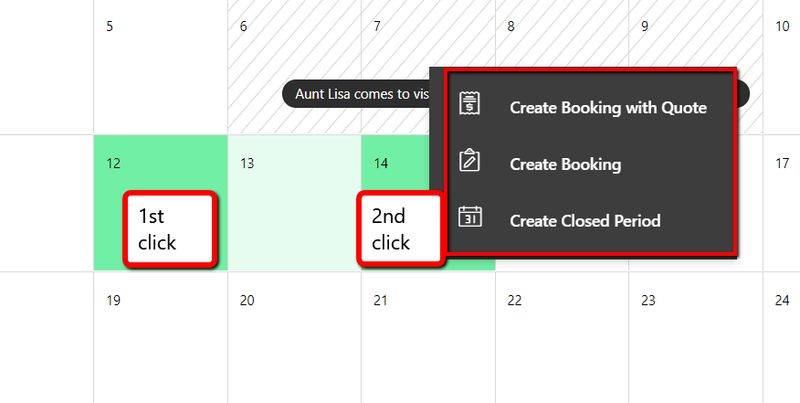 To create a booking or a closed period you can click on Create Booking in the top right corner or simply click on the calendar on the start date and then click on the end date. A little window will pop up where you can select to create a booking/closed period for the selected dates. The Multi Unit Calendar View will show you all properties/room types at a time with a time span of roughly 2.5 weeks. At the top left of the calendar you can choose the properties you want to see. Select the month and year you want to see. You can also simply scroll to the right or use the little arrows next to Today for navigation. If you have several units of one room/rental type, a number will indicate how many units are still available. The 6-Months Calendar View will show you up to a maximum of 5 properties with their respective room/rental types by default. It gives you an overview of the upcoming 6 months, showing always the entire month at first sight. Select the month and year you want to see. 💡 Note: You can see a max. of two years. 💡 Note: If a room type has several units and only some units have a booking, the dates appear in dark green as there are still units available. Only once all units are booked for the same day, this day will appear in red. If you have several units of one room/rental type, a number will indicate how many units are still available when hovering over a date. When you hover the mouse over an event (booking, closed period etc.) it will show the basic booking details. 💡 Note: Bookings imported via iCal don't contain any booking details. To create a closed period you can click on Create Closed Period in the top right corner. A little window will pop up where you can select to create a closed period for the selected dates.